Homepage - Bailey's Tree & Landscaping, Inc.
Bailey's is a family-owned company with a rich history in Sandusky, Ohio. Bailey's Tree & Landscaping, Inc., provides complete tree and lawn service, landscaping maintenance & design, snow removal, powerwashing and much more to keep your outdoor spaces in top condition. We proudly serve residential, commercial and property management clients in Sandusky, Huron, Vermilion, Bellevue, Fremont, Oak Harbor, Port Clinton, Marblehead, Catawba Island and the Lake Erie islands. Bailey's Buds 'n Blooms offers fresh, modern floral arrangements delivered to Erie, Ottawa, Huron and Sandusky Counties, Kelleys Island, Put-in-Bay, Middle Bass Island and Johnson's Island. 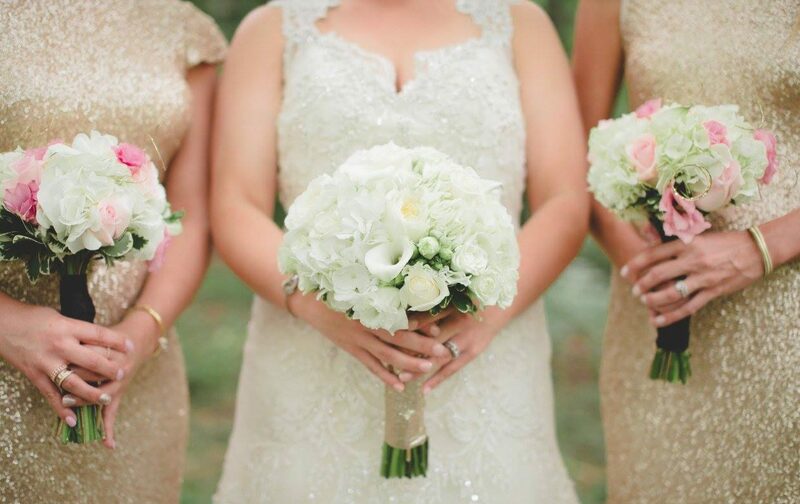 Floral Designer Emily Bailey is also available for wedding or funeral floral consultations to create specially-designed pieces to fit any event. Stop in our retail store, Bailey's Home Décor Shoppe, at our location at 3811 Venice Road, Sandusky, Ohio 44870 and find our garden center and our gift shop. We feature gifts for the home, for the bird lover, seasonal and holiday gifts, jewelry and many unique items you won't find anywhere else. We now feature a large selection of the popular GINGERSNAPS jewelry pieces, in both large and small sizes, in stock all the time. 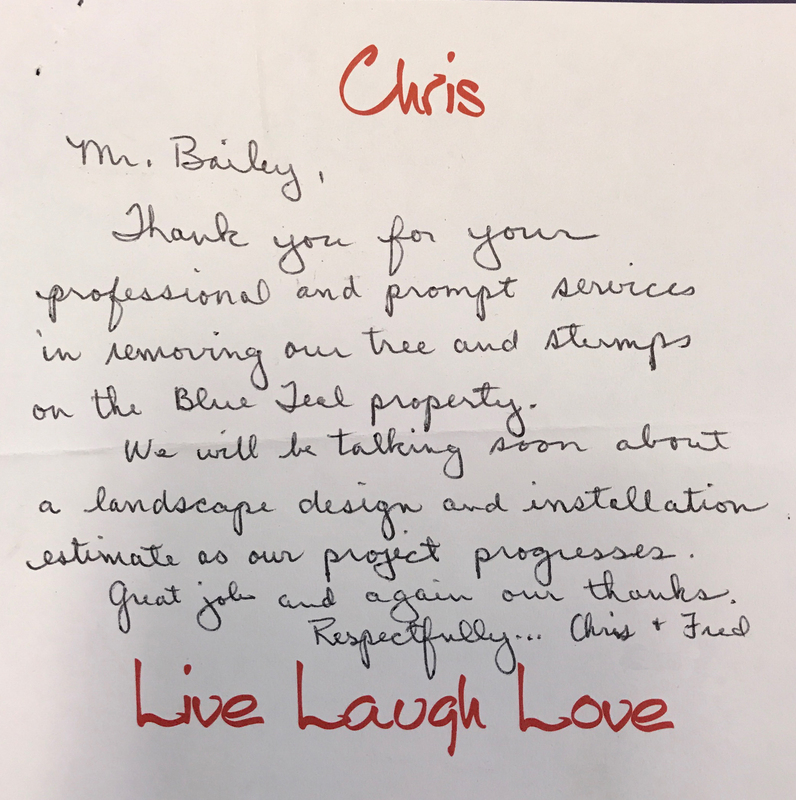 GET AN ESTIMATE from Bailey's Tree & Landscaping, Inc.
Mr. Bailey, Thank you for your professional and prompt service in removing our tree and stump on the Blue Teal property. We will be talking soon about a landscape design and installation estimate as our project progresses. Great job and again our thanks. 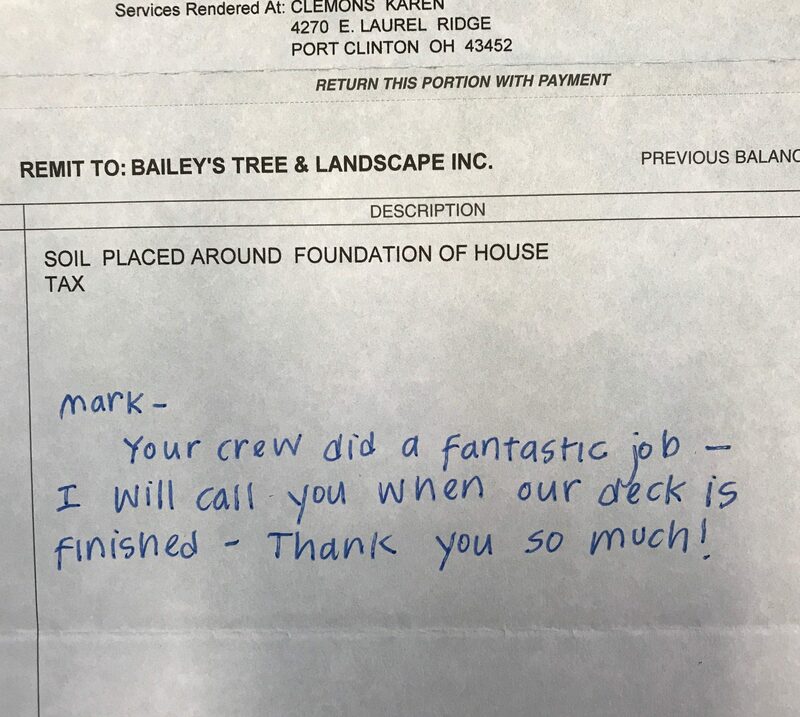 Mark - Your crew did a fantastic job – I will call you when our deck is finished. Thank you so much!